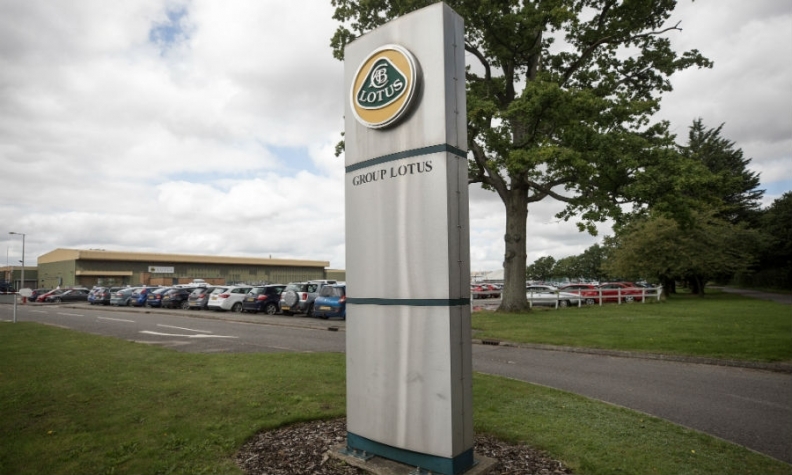 A logo stands outside of Lotus headquarters in Hethel, eastern England. An assembly hall sits rusting on a large factory complex in eastern England, surrounded by a vast expanse of green, productive farmlands. The forlorn structure is a reminder of the latest failed attempt to revive Lotus, a specialist sports-car maker and engineering powerhouse. In its heyday, Lotus was revered for lightweight racers. The company's engineering talent alone was so well respected it developed a successful consulting firm with clients that included General Motors, Aston Martin, and Tesla. But consumer tastes changed. When sports cars gave way to SUVs, Lotus suffered. Under an ambitious plan hatched in 2009, Lotus started building the new hall in anticipation of producing an expanded lineup of five new models. But the financial crisis and global recession got in the way, and Lotus's foreign bankroller didn't want to plow any more cash into the project. No new cars appeared, and sales continued to plunge. Work on the hall stopped dead. In a sign of how bleak things had gotten, Lotus's British network of dealers sold an average of just 11 cars per month in 2012. Now there are signs that things are turning around. Over the past three years, Lotus has been selling closer to 30 cars a month in its home market. Revenue is up, thanks to a combination of cost cutting and sales of higher-priced, limited edition models. Last month, the company said it was on track to be profitable for back-to-back years for the first time since the late '90s. CEO Jean Marc Gales has nursed the company back into the black, if barely, and he has reason to be optimistic. Lotus is about to be rescued by the same Chinese billionaire who bought Volvo Cars, just in time to help it maneuver the challenge of trading after Brexit. 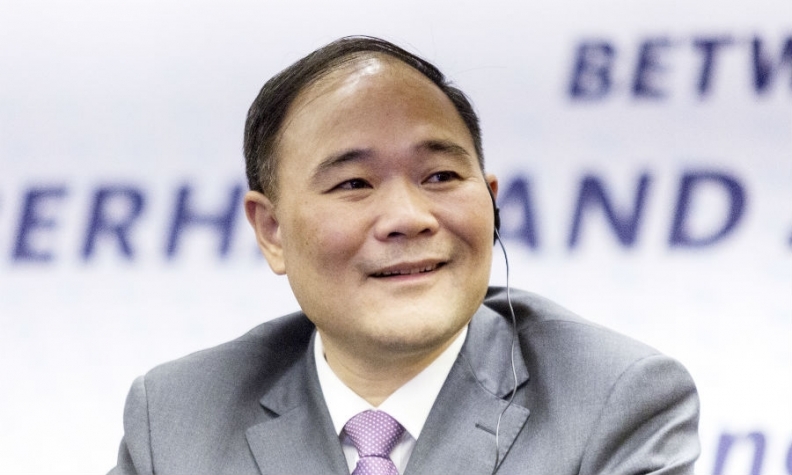 A controlling stake in the company of 51 percent has been sold for £51 million ($65 million) to Li Shufu's Zhejiang Geely Holding Group, giving Lotus a deep-pocketed parent. "This is fantastic, the best thing that could have happened to us," said Gales, who joined Lotus in 2014. The deal, announced in June, is expected to close this month. 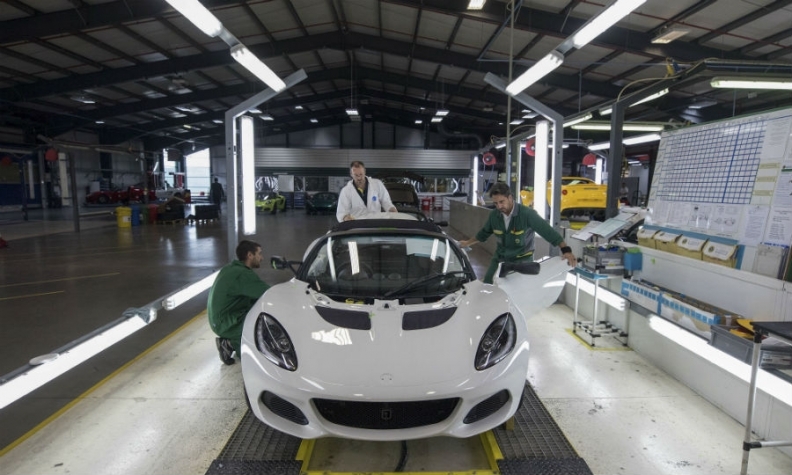 Employees inspect a Lotus Elise sports coupe as it moves down the production line. Founded in 1952 by an engineer, racer, and frenetic entrepreneur named Colin Chapman, Lotus has teetered on a knife's edge for much of its 65 years. Early on, Lotus turned out a string of successful racing cars, including Formula 1 and Indy winners, with such drivers as Jim Clark and Ayrton Senna. A procession of groundbreaking road cars followed, including the fiberglass-bodied Elite in the 1950s, the Elan roadster in the '60s, and the mid-engined Esprit in 1976. Behind the glitz and reputational success, the company bled cash and was rarely if ever on sound financial footing, with Chapman constantly juggling money between the car business and his other projects. A bevy of ventures into yachts, microlight aircraft, and bicycles rose and sank on his watch, while Lotus continued to attract a following for the cars' handling excellence. Then, in 1982, Chapman died of a heart attack at age 54 at the height of a scandal: Lotus had been hired by the DeLorean Car Co. for engineering input, but DeLorean collapsed amid accusations of defrauding the UK government with Chapman's help. Lotus's chief financial officer would go to jail for three years. Despite the turmoil, Lotus was still revered for engineering, aerodynamics and innovation. GM took over the company in 1987, only to lose interest and offload it in 1993 to Italian entrepreneur and Ferrari dealer Romano Artioli. Three years later, a bestseller would arrive to save Lotus and undergird its next two decades in business: the Elise, named after Artioli's granddaughter, admired for its feather weight, bonded aluminum chassis, and superior handling. Thanks to the Geely deal, a new Elise could arrive in 2020 for sale in the U.S., Gales said. In 2009, a new showman was brought on board to try to move Lotus from a cult favorite to the mainstream. Dany Bahar, a former Red Bull and Ferrari marketing executive, announced an ambitious plan he later admitted was a complete stretch: five new models. At the November 2010 Los Angeles auto show, he hired actress Sharon Stone, the Baldwin brothers, and other celebrities to pose with models of the new cars. After yet another ownership change, Bahar was fired in 2012. He sued and later settled out of court. Through a spokeswoman, Bahar declined to comment. Geely, little known outside of China, has surprised analysts with careful husbanding of engineering and executive talent at Volvo and other acquisitions. There have been much bumpier mergers over recent decades, including GM and Saab; BMW and Rover; and to a lesser extent, Ford with Jaguar and Land Rover. Volvo has thrived under the ownership of Shufu's Geely. Volvo has been thriving under Geely, which appears to operate on the seemingly revolutionary principle that the parent company provide cash while the existing engineering and design teams get on with what they do best. The Swedish brand set a sales record in 2016 and made a splash in July when it announced a move to an all-electric or hybrid lineup. In just two years, all its new cars will come with an electric motor, the auto industry's most aggressive target yet in the march toward the internal combustion engine's demise. After the Volvo deal, Geely in 2013 purchased London Taxi International, which makes London's distinctive black cabs in the UK’s English Midlands. The company plans to release an electric version this fall. Lotus has a longstanding association with electric vehicles. The company built and helped engineer the very first Tesla, the Roadster, in 2008. The Roadster was based on Lotus's groundbreaking Elise. The reputation for great engineering and innovative design, as well as skill in using materials once considered exotic such as aluminum, fiberglass, and carbon fiber allowed Lotus to launch a consulting business. The company contracted with larger manufacturers to cut weight, tune suspensions, curb emissions, and improve aerodynamics. The aluminum chassis of the Aston Martin DB9, for instance, was substantially engineered by Lotus. Chapman's original credo: "To add speed, add lightness" is now finding renewed relevance, even if his rule-flouting, risk-taking ways are no longer standard procedure. Electric cars could be a fantastic opportunity. But, Gales said, it has to be a Lotus lightweight and able to handle corners alongside any great sports car. "In two or three years, battery cars will be much higher performing than they are currently because technology moves on," he said. "It could be a really good thing to be the first one to do an electric car that doesn't weigh two tons." Gales hinted that with Geely's funding, Lotus could even produce an SUV. Of greater concern is Brexit. Britain's decision to leave the European Union could hurt Lotus's bottom line, depending on the form of post-Brexit trade deals. Half of production goes to the EU, and altogether 85 percent of sales are abroad. Tariffs could pinch. "Of course, we hope for a soft landing," Gales said.